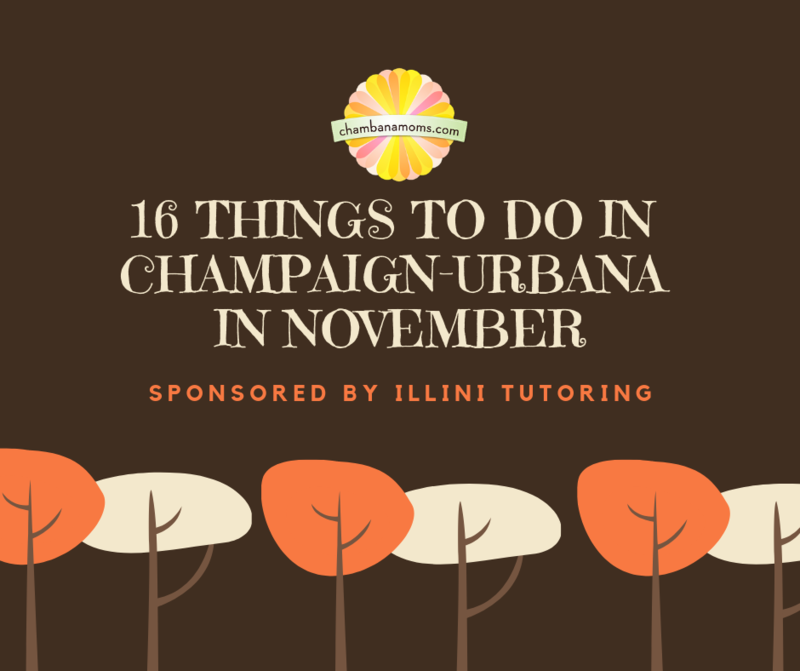 Thanks to Illini Tutoring for sponsoring 16 Things to Do in Champaign-Urbana in November. Illini Tutoring has been serving students in C-U since 2010. Certified teachers and tutors help them excel in math and science classes and raise their scores on the ACT, SAT and SSAT. Illini Tutoring is a mom-owned company with a big heart for the community, donating thousands of dollars each year to support local public schools and other community projects. For more information visit the website, email or phone. Just can’t wait for Christmas? Visit Prairie Gardens to see what’s new. Enter to win your favorite fully-decorated tree. See 12 beautifully decorated Christmas trees on display for a chance to win your favorite (decorations and all). Enjoy free food sampling and refreshments. The opportunities to interact with Illini football are dwindling, and Saturday’s weather seems pleasant enough to enjoy the Illini Walk (noon) and Grange Grove before the game against Minnesota. Diwali might be unfamiliar to some, but we have provided a kids-friendly guide to making the most of the holiday with your family. Celebrate games during International Games Week at Champaign Public Library, which will have a variety of games to play, including board games, video games, virtual reality and more. Prepare for a theatrical escapade that celebrates creatures of both land and sea with acrobats, singers, musicians, and playful animations that bring to life tumbling kangaroos, juggling zebras, and dinosaurs that rock and roll — all at Krannert Center for the Performing Arts. Central and Centennial theater departments come together to present Shrek: The Musical! It’s a magical story featuring some familiar fairy tale faces including Pinocchio, the Three Little Pigs, Shrek, Donkey and Princess Fiona. Smile Doctors will pay $1 per pound of candy to the child donating it (up to 10 pounds), donate $1 to the Crisis Nursery, and all of the candy goes to the troops via Operation Gratitude. A satirical comedy musical that takes its shots at any number of establishment systems, the performance is best served for those ages 13 and above. If you’re having withdrawal symptoms from not getting to experience Urbana’s Market at the Square (which ends Nov. 3), do not fear. The Market in the Square picks up the baton inside Lincoln Square. The Champaign Park District Youth Theatre program (fifth- through eighth-graders) brings to life the award-winning film and stage play based on a classic fairy tale. Tickets are $14 for adults, $12 for children. The Junior League of Champaign-Urbana’s Daddy Daughter Dance is now the Family Winter Ball. All family members and children 12 and under are welcome to dance and enjoy a private viewing of the Festival of Trees. Mrs. Claus will lead a special story time and children will have a chance to meet with Santa and Mrs. Claus — with pictures! Come celebrate with us! We’ll tumble, flip and twirl together to celebrate our ninth birthday. FREE! Join the Urbana Park District for a Thanksgiving morning tradition. It’s a one-mile run/walk in Crystal Lake Park, a great excuse to spend the rest of the day replenishing the calories that you burned off in the morning! Skate off that great Thanksgiving meal and enjoy some family time during the Turkey Skate at the University of Illinois Ice Arena from 11:30 a.m.-2 p.m. and 7:30-9:30 p.m.
Santa makes his way through downtown Champaign in this annual event that gets everyone in the holiday spirit. Pre-parade entertainment begins at 5 p.m. with the parade at 6. Be sure to check out our Parade Guide for a comprehensive list of area holiday parades.